RIM reshuffle: is it just going through the motions? Like many closet BlackBerry fans, I was filled with a sense of hope and joy I hadn't felt for years when I heard that RIM had a new CEO. But the reshuffle that would make real changes at RIM is the kind that involves reshuffling Lazaridis and Balsillie off to a tropical island, pension books in hand. What RIM has actually done is execute another weird PR move, like the time it tried to tell us it was launching five new phones when it was actually only launching two. Guess who's going to be new CEO Thorsten Heins' right-hand man? It's the newly-appointed vice chair of RIM's board, of course – a certain Mike Lazaridis. And who's going to head up the company's new Innovation Committee? An energetic young upstart? A savvy Don-Draper-style exec poached from HTC or Apple to rejuvenate the BlackBerry range? Nope, it's Lazaridis again. You have to wonder how much power newly minted CEO Thorsten Heins is really going to have with ex-CEO, majority shareholder and personification of the company Mike Lazaridis hanging around, "counselling" his every move and pulling his strings. Even Heins' introductory video sounds as though it was scripted by the out-going chiefs. 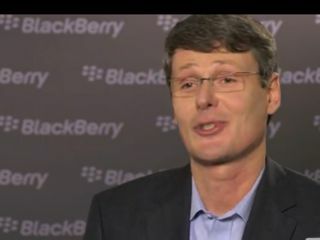 He speaks of RIM sometimes "innovating too much" and says the company "always thinks ahead" and is "fantastic" and is "absolutely heading in the right direction". I don't mean to knock Lazaridis and Balsillie - there was a time when they were great CEOs for RIM, you know, back when they built the company up into a multi-million dollar, multinational business. But those days are gone and replacing Lazaridis and Balsillie with someone who's singing from the same outdated songsheet is not what RIM needs. In his parting interview, Mike Lazaridis said, "There comes a time in the growth of every successful company when the founders recognise the need to pass the baton to new leadership." And for RIM that time was 18 months ago, so what difference can Heins make now? Well, he's going to focus on getting BlackBerry 10 hardware out later this year. He's got to work with what he's given, I know, but this is too slow – RIM has to be snappier about getting its next-gen hard- and software to market. BlackBerry 10 could have competed with Android 2.3 and iOS 5 but now it'll have to take on generations of Android and iOS that we haven't even seen yet. Heins is also considering licensing BlackBerry 10 to other manufacturers – but who will take it? We can't see any major players sniffing around the massively unproven OS so RIM's looking at making a few pence from a handful of lower-end, white-labelled handsets at best. But his immediate focus is going to be on delivering the PlayBook software update on time (well, as on-time as an update that's already several months late can be) and pushing the current line-up of somewhat uninspiring and kind of aging BlackBerry 7 handsets with rejuvenated marketing and PR campaigns. Great. Fine. Acceptable. But there's nothing in the action plan that's getting the butterflies fluttering in my tummy. The comparisons with Nokia are almost unavoidable - when the Finns took action on their ailing business, they brought in someone new, someone fresh, someone a bit exciting. Sure, it was someone who may prove to be a Trojan horse at some point in the future, but you can't deny that Elop has taken Nokia in unexpected directions and pumped new life into the company. It's so easy to knock RIM, so don't get me wrong: there are plenty of us out there who genuinely want to see the company recover. But I fear that Heins with a side-helping of Lazaridis is just a bit too RIM to do it.